The production and sale of electric vehicles accelerated in 2016, with two million cars manufactured and over 750,000 sold globally, according to the International Energy Agency’s (IEA) 2017 Global Electric Vehicle report. And the market is expected to boom further in the coming years. The report predicts electric car stocks will range from between nine million and 20 million by 2020 and between 40 million and 70 million by 2025. Countries around the world are also attempting to ban the sale of petrol and diesel cars, and are encouraging motorists to go green. However, electric vehicles are not emissions-free. While these vehicles obviously run on electricity, that electricity typically comes from a mix of emissions-intensive fossil fuels, nuclear energy, and power from renewables. That is, unless you live in country like Norway, which generates virtually all of its electricity from hydropower. But Norway is the exception rather than the rule. 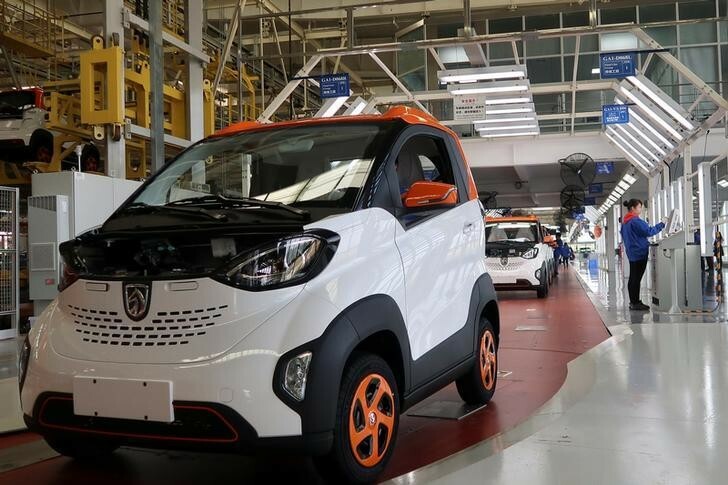 At the other end of the scale, China, whose electric vehicle market accounts for 40% of all sales globally, drives the most emissions-intensive electric cars. That is according to data from Bloomberg New Energy Finance (BNEF), which shows the majority of China’s electricity comes from coal. While China is among the nations working to curb the production of fossil fuel-powered vehicles, its appetite for coal has intensified in recent years, from a global share of 13.6% in the early 1970s to 44.5% in 2016. As a result, China produced 3,242 million metric tonnes (MT) of coal in 2016, dwarfing the world’s second biggest producing nation, India, which accounted for 9.7%, or 708 Mt, of the world’s total in 2016. 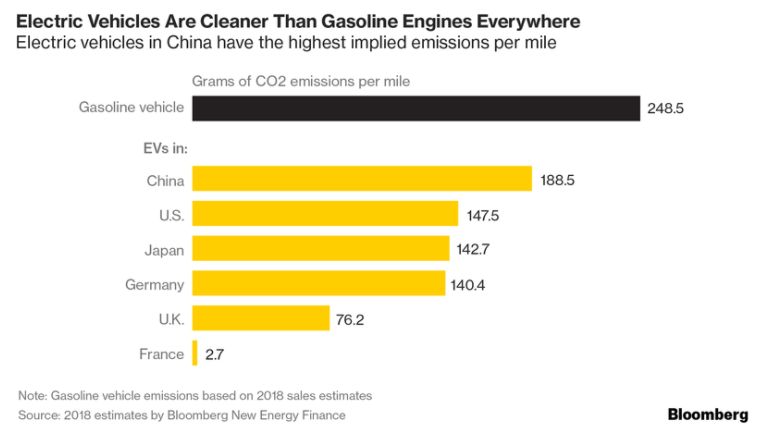 According to BNEF’s data, electric vehicles in China produce 188.5 grams of carbon dioxide (CO2) emissions per mile, the most of any country globally. In comparison, electric vehicles in the United Kingdom produce just over 76 grams of CO2, while in France just 2.7 grams are produced per mile. 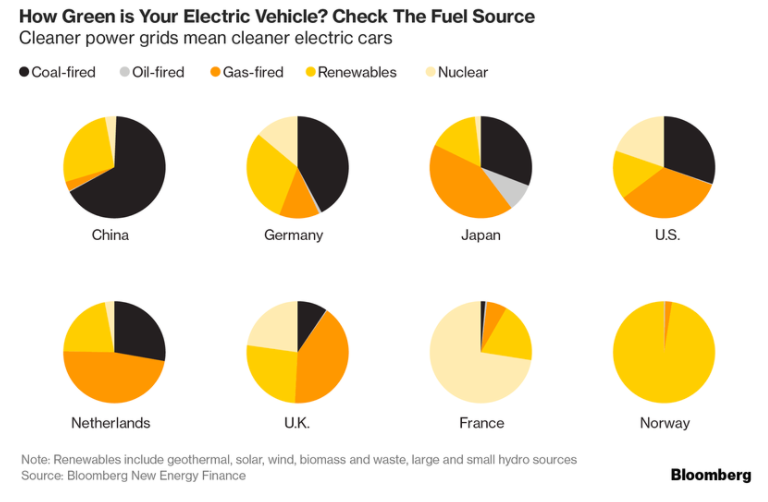 In reality, though, driving an electric car is still far more environmentally friendly than driving a gasoline-burning vehicle, which typically produce about 250 grams of CO2 per mile, BNEF says. BNEF also points out that electric vehicles were 39% cleaner on average than using internal combustion engines in 2016. That gap is expected to widen to 67% by 2040, as renewables such as solar and wind make up a larger share of the global energy mix. China is at the heart of this renewable energy revolution, having announced last year that it would invest $360 billion in renewable energy by 2020 and scrap plans to build more than 100 coal-fired plants (although Chinese corporations are backing coal power projects overseas). The IEA Renewables 2017 report also predicts China will account for over 40% of the total global clean energy mix by 2022. This is the result of meeting various capacity targets and addressing concerns about the country’s air pollution. In recent months, for example, China has deployed various novel technologies designed to clean the air, including a 100-metre-tall smog-sucking tower in the city of Xian. China has also already surpassed its 2020 solar panel target, and the IEA says it expects the country to exceed its wind target in 2019.